Your Snow Plow Expert! Your Snow Plow Expert! We sell and service a full line of snowplows and salt spreaders for your vehicle. Our Sno-Way products include heavy duty snow and ice control equipment including snowplows, snow plow accessories, sand and salt spreaders. Stronger, Smarter, Better through Innovation is more than just a slogan, it's the heart and soul behind every Sno-Way product and innovation. It's the relentless pursuit to design and manufacture the most durable and efficient plows. It's what makes the Sno-Way name the strongest in the industry. Stop in for a demo today! 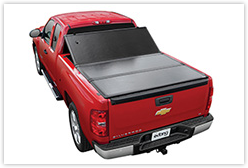 Check out the new tonneau cover by Extang. You get all the benefits of a hard cover and more. The cover can be opened from the front or the back and removes in seconds. Tired of your receivers just lying around and you can never find them when you need them! Check out the all new receiver caddy now at MTT. 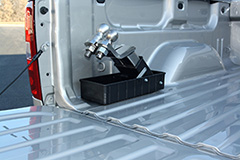 The receiver caddy can neatly hold you receivers in the bed of your truck. Your truck a little messy? Check out the all new DU-HA storage unit. 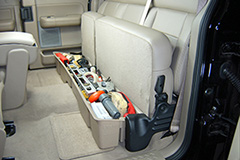 The DU-HA stoage unit is custom made for your make and model truck to fit under the rear seat and organize your stuff. Now available at MTT.